The problem is, the iPhone doesn't have an image editing application. So what do you do if you want to make a few adjustments to your picture after it's posted online? 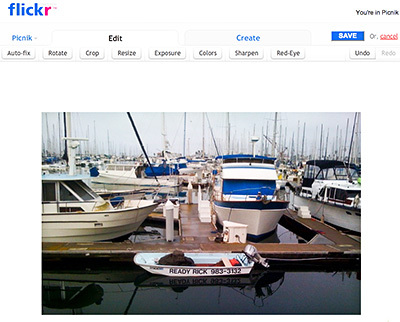 A while back, Flickr struck up a deal with Picnik to enable roundtrip image editing from your Flickr library. 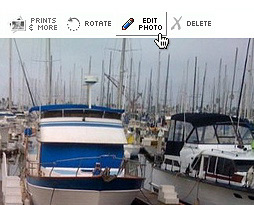 You have all the common tools available, and when you're done, Picnik updates your Flickr library with the adjusted photo. It couldn't be easier. "I had been trying to consider how to tackle the theme of "Empty" for a recent TDS photo assignment, when a significant snowstorm provided the inspiration," said Mike Doel. "In addition to knowing that the golf course would be empty, I figured that it would also be a good example of one of the tips I've learned from The Digital Story - try to find photos that catch views that are unique or unexpected." "When I arrived at the course, the first thing I did was to get permission to take photos. Having received that (as well as a "you've got to be nuts" look) from the staff member in the pro shop - surprisingly still open for business - I headed out with my Canon 5D, my Canon EF 24-105 f/4.0 L IS USM lens, and my tripod. The first tee box was cluttered with fallen branches and other debris, so I hiked down the ninth fairway to get a better shot." 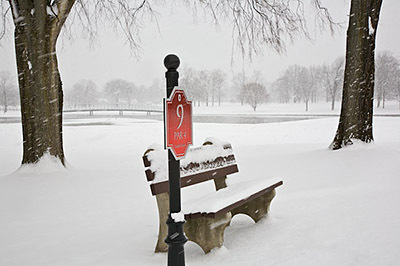 "The shot was composed with five main elements - the red sign that tells the viewer we're at a golf course, the "empty" bench which reinforces the theme of the assignment, the two trees on either side, and the background with the lake and foot bridge. The shot is perhaps a bit too symmetrical (it would have been better if I gotten the bench a bit more to the side), but I was having a tough time doing that without obscuring the bridge. I especially liked how the red of the sign stood out against the white background, and it was the sign that I focused on." "From another one of Derrick's tips, I knew that snowy scenes like this can fool your camera's light meter, which expects to find scenes with lots of midtones. Since snow is white and not 18% gray, I knew I had to over-expose the image to get the right color. I figured about 1 and 1/3 stops of over-exposure would do the trick, but I ended up using Aperture's exposure slider to actually boost it a bit more in post-production. The shot was taken in manual exposure mode at an aperture of f/16, shutter speed of 1/60th of a second, and an ISO of 100. The 1/60th of a second shutter speed is just long enough to provide a bit of motion to the falling snow." "When shooting in really cold temperatures like this, you have to be careful about bringing your camera back into warmer temperatures - especially if it's into a room with any significant humidity in the air. The water in the air could condense onto your cold camera equipment (similar to what happens when people with eyeglasses come inside from the cold) and cause all kinds of havoc. A good tip is to put your camera into a gallon ziplock bag before coming inside. Once the camera has warmed up to room temperature, it is safe to take it out of the bag." Photo of 9th Tee by Mike Doel. "How I Did It" is a new feature of The Digital Story featured on The Digital Photography Companion mini site. These are techniques from virtual camera club members who have built upon information in The Digital Photography Companion, or have come up with new tips altogether. We're building a living library of knowledge for everyone to use (and contribute to). If you have a "How I Did It" tip to share, just send it to me with the sample photo, and put "How I Did It" in the email subject. Tethering a camera to your computer allows you to capture images directly into it. This is particularly handy for product shots and in-studio portraits when you want to see a full resolution version of the photo right away. 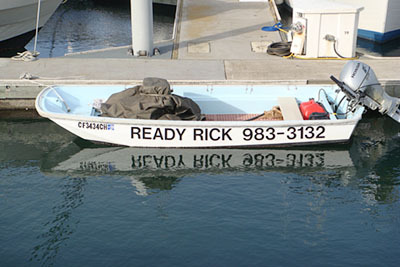 With a tethered camera, you click the shutter and the image appears on your monitor. Just like that. 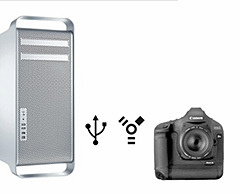 Many DSLRs will have tethering software bundled in their kit. 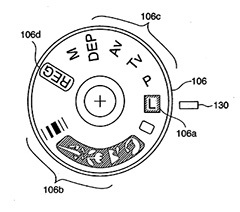 Both Canon and Nikon provide this feature on most of their advanced cameras. Check their software disks for more information. Aperture 2 also provides tethered shooting. You can refer to this chart to see if your Canon or Nikon camera is supported. In general, tethered Nikon DSLRs work with both Tiger and Leopard, and Canon shooters must be running the Leopard for this feature. If you have a camera and software that supports this technique, I suggest you give it a try. It's a great feeling to click the shutter, and then see the image appear instantly on your computer monitor. If you have your own web site, QuickTime Pro makes it easy to take video snippets off your digital camera and post them there. Its "Export for Web" option under the File menu presents you with some sophisticated publishing options... except now they're as easy to implement as checking a box. The process couldn't be simplier. Open the movie you want to publish. Choose "Export for Web" from the File menu. Select the options you want: iPhone (WiFi), iPhone (cellular), and/or Desktop. Choose as many as you want. When you hit the Export button, QuickTime will create a folder with the different versions of the movie in there. It also creates a web page with instructions for publishing to your site. My little bonus tip is this. Open that web page of instructions in your text editor, change the text to what you want to say, save the html file as a new name, and upload the entire folder to your web server. That page contains all the scripts you need, perfectly formatted, and pointing to your movie. As long as you leave everything in the same folder, you're set. That's how I created this version of A Visit to the Tampa Aquarium. It is viewable in a web browser, on Apple TV, or on an iPhone. The built in script identifies what type of device is accessing the page, then serves the appropriate movie for that device. It's really quite clever. You already know that I'm a big fan of the movie mode on our digital cameras. 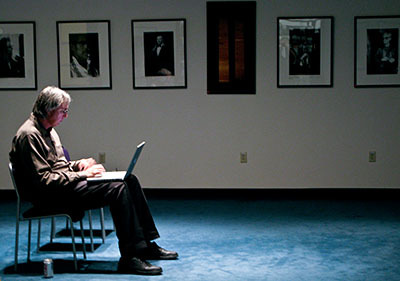 Now sharing those movies on your own web site is as easy as capturing them in the first place. On first encounter, the Sony DSC-T200 is just too beautiful to be taken seriously. I was seduced by its slim design -- about the same proportions as an Apple iPhone -- with "folded" 5X Carl Zeiss Vario Tessar zoom lens, an 8 MP image sensor, and a 3.5" touchscreen LCD, all housed in a brushed metal housing that feels as good as it looks. There's no way this camera can perform as well as it looks. I decided to take it out in the field and test its mettle (or test its metal in this case). Well, for starters, it just slid into my front pants pocket. Oh man, that was too easy. But, when I got in the field, I did encounter my first aggravation. The touch screen wasn't responding very well to my finger taps. "I just knew it," I muttered. Only to discover that there's a nifty stylus that attaches to the very nice wrist strap, and it totally solves the problem. In bright light, the LCD was a bit hard to see. And there is no optical viewfinder. So this is a legitimate complaint about the camera. However, the screen is quite viewable in all but the harshest of light. When you slide down the front cover to reveal the 5X Zeiss lens, the camera fires up quickly. In fact, overall response time, including shutter lag, is fantastic, especially for a compact of this size. Oh, and that lens: sharp. Sony's menu system has really come a long way. I once not cared for their approach, but now I like em. If you get lost, just hit the Home button in the upper left corner. From there, you can access submenus for: Shooting, View Images, Output, Memory Tool, and Settings. It took me about 15 minutes to get the hang of this. To make things even easier, the Display had three modes: Normal (lots of controls), Simple (just a few basic controls), and Image Only. When you're in Normal mode, it seems like there's an icon for just about any control you would need. Oh, and there's a button to turn off and on the live histogram. Very nice. The T200 includes all of the current technology you would want: Face Detection, image stabilization, full frame SD movies at 30fps, and an nice array of scene modes. The macro mode is terrific on this camera, and what really impressed me, is that I could use the flash when only inches away from the subject and still get a great exposure. And if I didn't like it, there's a nifty pair of flash exposure buttons to increase or decrease it a tad. As for the pictures themselves... very good for a compact. All the normal rules of the road apply: keep the ISO down to 400 or below and you're in great shape. The movies were solid too. The prints I made from the T200 were sharp with good color. There are a couple things I don't like about this camera. I'm not a fan of Memory Sticks, but that's what you have to use with Sonys. The camera has an accessory HD cable for viewing your still photos on an HDTV, which is cool, but the camera doesn't include an HD movie mode, or even a 16:9 movie capture. Seems like a missed opportunity. 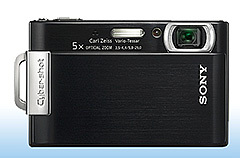 And for an 8 MP compact, the DSC-T200 seems expensive at $350 US. But the pros are strong indeed: beautiful design, great lens, big LCD, sharp pictures, easy controls, latest technology, and very easy to carry around. I really didn't want to like this camera. I was planning to use it for a while, then sell it to recoup my investment. But darn, if I didn't really get attached to it. I just couldn't help myself. For the second shot, I turned on the "Flash" WB to warm up the scene. 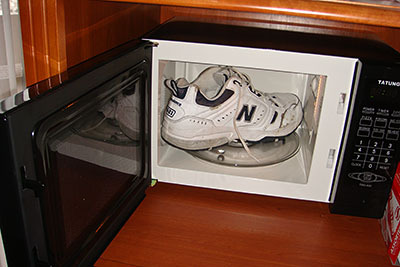 I've found another great use for the microwave over. I was shooting some water shots recently and actually found a way to soak my sneakers. I'm not talking about a little wet, I mean drenched from stem to stern. I tried just letting them air-dry for a couple days, and got nowhere. Because I was staying in a hotel, I didn't have a traditional clothes dryer available. After a few days, my good ole sneaks started to smell a little funny. It occurred to me, that when sponges in the kitchen start to smell funky, a good way to reverse the tide is put em in the microwave for 30 seconds or so to kill the little critters causing the offending odor. Why not for sneakers too? James Davidson: To Delete or Not to Delete? There's an interesting post over on Inside Lightroom about whether To Delete or Not to Delete. Working photographer James Duncan Davidson grapples with the same issue we all do: how much of our image data should we hang on to? Duncan puts forth some interesting ideas. And even though he probably shoots more pictures than the average guy, it's interesting to read how he deals with the mountain of gigabytes he accumulates annually. I spent yesterday evening locked in Samy's Camera store in Santa Barbara, CA (oh the humanity!). We were shooting video for my upcoming digital photography title on Lynda.com. In the shot illustrated here, I'm discussing the difference between large aperture zooms (using the Canon 70-200 f-2.8) and smaller aperture zooms (Canon 70-200 f-4). 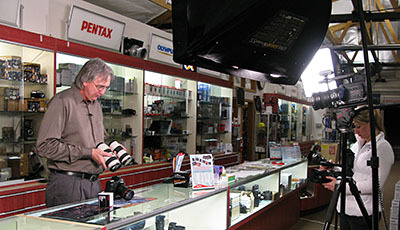 We were very fortunate to be able to use a real camera store as a set. Richard, one of the store managers, even stayed after hours (10 pm!) to enable us to keep recording long after Samy's had closed. We shot at the photo counter... imagine being able to grab just any camera you want when trying to make a point. Then we moved over to the lighting area to set up another series of shots. One of my favorite areas of the Santa Barbara store was the image gallery in the back that features shows by top name photographers. A technical director on the shoot, Max Smith, grabbed my G9 and captured this shot of me checking email in the gallery during a break in the action. I think the live action footage that we recorded in Samy's is going to be a nice addition to the title. It will be combined with some other cool studio techniques that we came up with at Lynda's. The first of the three titles should be out next month. I'll keep you posted. 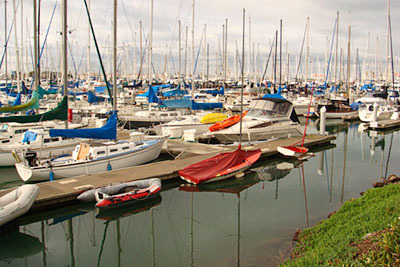 Photos by Max Smith, captured with a Canon G9 at Samy's Camera store in Santa Barbara, CA. Nikon D3 - King of the Roost? "The Nikon D3 digital SLR is Nikon's first ever full-frame camera, offering a 12.1 megapixel, FX format CMOS sensor. The 9fps continuous mode, even when shooting RAW images, should appeal to all the sports photographers out there, supported by Nikon’s next-generation 51-point AF system. The Nikon D3 has an incredibly versatile ISO range of 100-25,800 (yes, ISO 25,800! ), new EXPEED image processing engine with 14-bit A/D conversion and 16-bit image processing, and a high resolution 3 inch LCD screen with 920,000 pixels. Other standout features include Live View with Autofocus, support for the DX-format crop mode, which means that DX lenses can be used with the D3, and HDMI video output for connection to high-definition video systems. All of this and more is housed in an environmentally-sealed magnesium alloy body. With a street price of over £3,000 / $5,000, the Nikon D3 certainly doesn't come cheap, but even if you can't afford it, the D3 does give a tantalising glimpse of what the future might hold for Nikon's more affordable DSLR models."